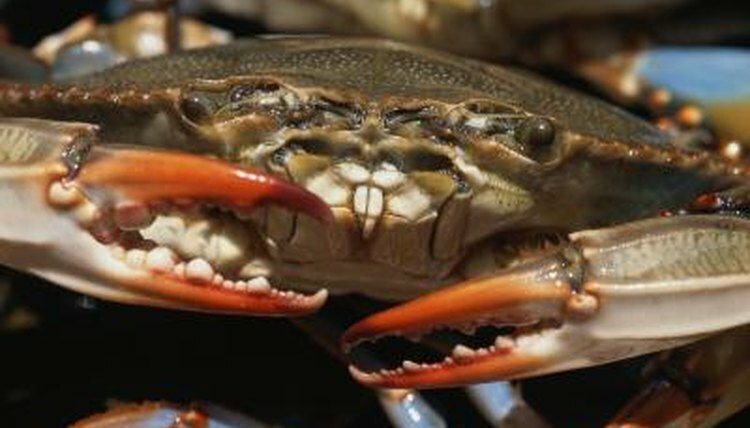 While crabs do often ingest food that needs to be mashed or crushed, a service performed in humans and many other animals by teeth, they do not actually have teeth inside their mouths. Other parts of their body, however, exhibit “teeth,” and they do have a variety of structures inside their mouths responsible for macerating food and getting it to their stomachs. Crabs ingest food through their mouths just as we do, but do not use teeth to grind it. Depending on the species, they may have only soft, feathery mouthparts, or much harder ones. The hermit crab (Coenobita clypeatus) has delicate mouthparts called maxillopeds that help move food into its mouth. The Dungeness crab (Cancer magister) has several types of mouthpart: those for holding food, for breaking it up into smaller pieces and for moving it farther into the mouth. Crabs often have structures called teeth on their shells, or carapaces. These structures, which are not used for chewing, look like ridges, protrusions or zigzags in the smoothness of the shell. The Atlantic rock crab (Cancer irroratus), for instance, has nine teeth toward the front of its shell on each side. Interestingly, different members of the species have differently shaped teeth, seeming to depend on diet. Other crabs have different numbers of carapace teeth, which are also sometimes called spines. The Dungeness crab, for instance, has a total of 10 spines on each side of its shell. Some other crabs have teeth in their stomachs, odd as it sounds. The decorator crab (Oregonia gracilis) uses a hard, exoskeleton-like structure in its stomach to grind up food that is passed into its gastric tract. The “teeth” in the stomach grind against one another when the stomach contracts, mashing up food for easier digestion. These gastric teeth are present in other species, such as the brown crab (Cancer pagurus), and even in some types of lobsters. Crabs eat a variety of foods and most are considered omnivorous. They will attack and eat live food but will also scavenge food from dead animals. The Atlantic rock crab, for instance, eats algae, polychaetes, mussels, gastropods and even other crabs, like the hermit crab. Dungeness crabs, on the other hand, are generally carnivorous as adults—preferring clams, oysters, fish, shrimp and worms—but feed on plankton as larva.